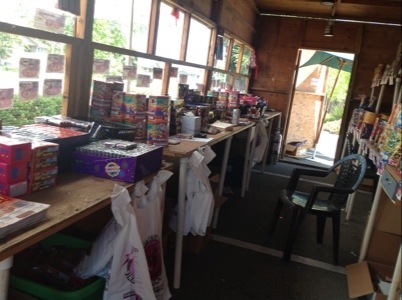 It is eerily quiet in the Fireworks Booth. Our friends have packed up and left, the boys are clustered around the table in the trailer and Bobby is making T- Shirts on the other end of the parking lot. I am “manning the booth” and not one soul has stopped to buy the exploding wares I sell. The days go like this: a mad rush of customers, crowds of friends and family visiting, kids riding bikes and playing cops and robbers, students holding signs by the street- then then all leave and quiet… quiet…quiet. I am not going to lie to you (what would be the point in that?) – I am enjoying the reprieve. I am a creature that thrives in the quiet and relishes the cool whispering breeze wafting through the empty booth. The only noise about is the the constant rush of traffic, the chirp of the summer birds and the occasional bark of my dog who is happily enclosed in his nearby kennel. Of course the paradox of this moment is that I wouldn’t appreciate it so much if I didn’t also have the mad rushes, the visits, the kids, students, the noise and hubbub of it all. I need both. God created each one of us with unique temperaments, personalities and gifts but He made all of us with the need to connect with Him and others. We are made to be interdependent on each other and to flourish in our uniqueness. The challenge is to thrive in both. For the moment, I will flourish in this quiet moment and be utterly thankful for the bustling ones. What kinds of moments do you flourish in? What moments are you utterly thankful for today? Love this sweet little snippet. Thanks!